KBC will introduce a new market-leading 10-year fixed mortgage rate on October 2nd, in a move which will increase pressure on competitors to cut rates. Ever since AIB cut a range of its fixed and variable mortgage rates on September 15th, all eyes have been on Ireland’s other banks to see which would be the first to react. As was the case the last time AIB cut its standard variable rate in May 2016, KBC has been quick to respond with an announcement of its own. The bank will introduce a new 10-year fixed rate mortgage, which will be available to new and certain existing customers from October 2nd. So, what do these cuts mean for borrowers? From October 2nd, borrowers with a loan-to-value ratio of under 60% will be able to fix their mortgage rates with KBC at a market-leading 2.95% for 10 years. Loan-to-value ratio refers to the proportion of a property’s value that a customer has to borrow in order to make a purchase. So, an LTV of under 60% means that the customer is borrowing less than 60% of the property’s value. Currently, Bank of Ireland is offering a 10-year fixed rate of 3.80% and is the only leading bank making it possible for borrowers to fix their rates for this period of time. 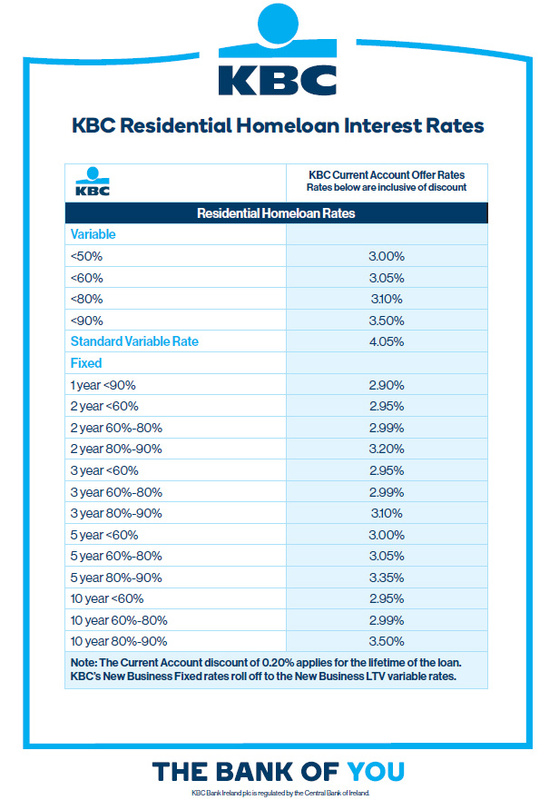 So, KBC’s new rate will lead the 10-year fixed rate market once it comes into effect. It’s important to note that the bank's new rate includes a 0.2% mortgage rate discount that is available to its current account customers. The bank recently made it possible to open a current account in just five-minutes via its new app. Let’s look at an example of what KBC’s new rate will mean for your pocket. Say you’re a second- or third-time buyer, looking to buy a €500,000 house and need to borrow €250,000 to make the purchase, i.e. you have an LTV of 50% and would therefore qualify for KBC’s new rate. And let’s say you’d like to repay the loan over 20 years. Under the bank’s new rate, you’ll be able to fix your rate at 2.95% for 10 years, which will mean a monthly repayment of about €1,380. There’s a lot to be said for the peace of mind you get from fixing your rate for this period of time in Ireland’s notoriously volatile mortgage market. In fact, 70% of KBC’s new mortgage customers over the last three months have opted for fixed rates. In addition to its new 2.95% rate, KBC is set to introduce a 10-year fixed rate of 2.99% to customers with an LTV of under 80%. Again, this rate includes the bank’s 0.2% discount for current account holders. This rate is likely to be more popular with first-time buyers, who usually have to borrow large proportions of the value of a property to make a purchase. Let’s say you’re buying a €300,000 house and are borrowing €225,000 over 30 years. This would give you and LTV of 75% and would qualify you for KBC’s 2.99% rate. At the bank's new rate, your monthly repayment would come in at about €952, which would be fixed for a decade. KBC’s new rates are available to new mortgage customers, as well existing borrowers who are currently on a variable rate or are coming to the end of a fixed rate term. The bank is also offering 50% off KBC home insurance for a full year to new customers, as well as €3,000 cashback to customers who switch mortgages. Here’s a list of KBC’s new mortgage rates, which will be among the most competitive on the market from October 2nd. KBC’s new mortgage rates are good news for customers, who are starting to see their options increase and their rates decrease. The move, which comes as a reaction to AIB's recent rate cuts, is a signal of the competitiveness re-entering the Irish mortgage market. It’ll be interesting to see if Bank of Ireland, Permanent TSB, Ulster Bank and others now feel the need to react with cuts of their own.